I am a cooking class junky. I love going to cooking classes. So imagine my happiness when I was recently invited to the Main Dish Salads Cooking Class by Patricia Rose of Fresh Food in a Flash. 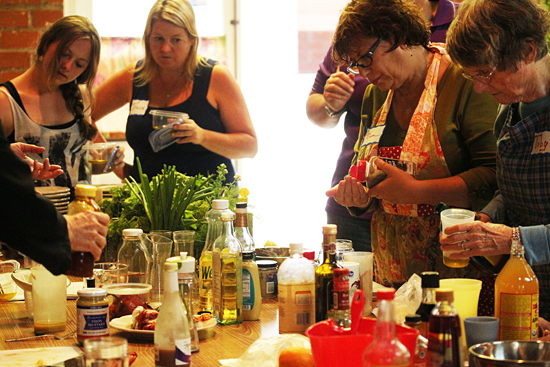 Her classes are hands-on and it is so fun to watch her students preparing her recipes, cutting and chopping, cooking and assembling, and finally sitting down together at the big communal table for a wonderful meal they have prepared. 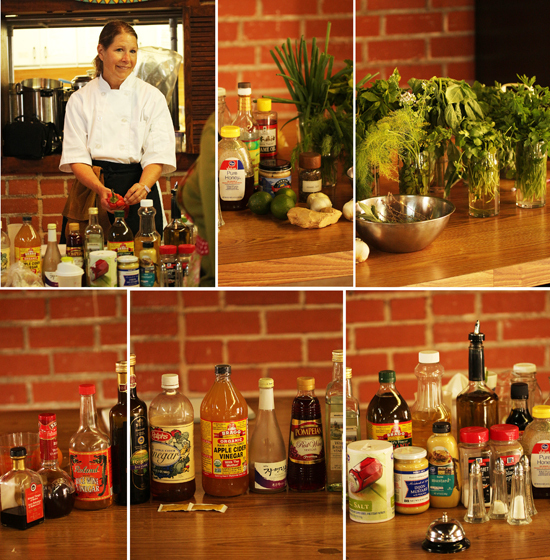 When I arrived I saw the big table covered with vinegars, oils, flavorings, seasonings and every herb on the planet. 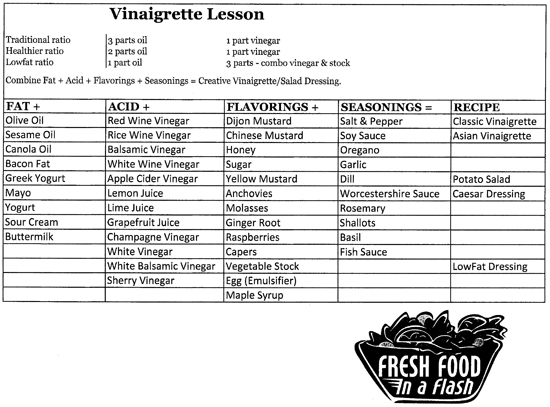 Patricia started out the class with an introduction to the vinaigrette. Here she is in her chef’s coat talking about the various components. Part of the recipe packet was this diagram for building a vinaigrette. It definitely sparked my imagination. Each student mixed up their own vinaigrette from the ingredients on the table and drizzled it over their very own little green salad. There were some smiling faces to be sure. Then it was on to the tables where all the students began cutting and chopping for the salad recipe they had chosen to make. 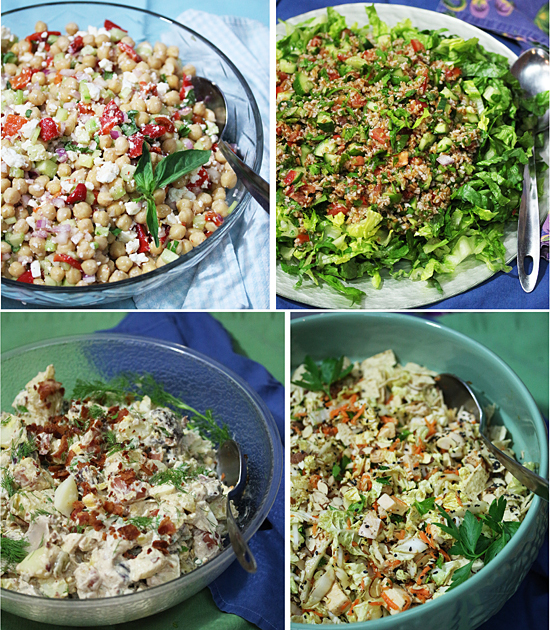 There were five tables, each with the ingredients for one of the salads to be prepared. 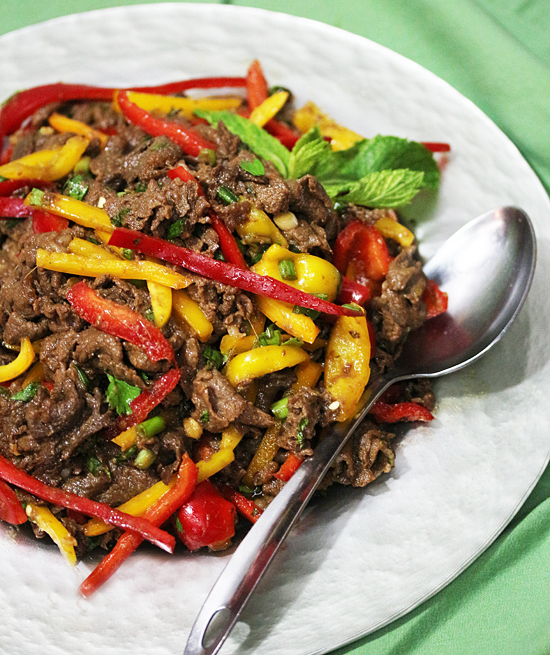 In addition to the Thai Beef Salad (recipe below), the students also prepared a Ten-Minute Chickpea Salad with Feta and Basil, Lebanese Tabouleh Salad, Chinese Chicken Salad, and Bacon and Potato Salad. This was truly Salad Heaven. 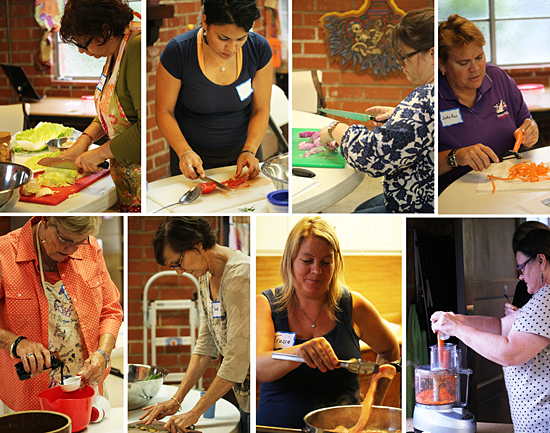 Patricia’s next class is a Summer Barbeque Class on Thursday, July 24, 6:00 – 9:00 PM. The menu includes: Fresh-Made Ricotta Cheese, Zucchini-Ricotta Roll-Ups, Chicken Satay Burgers with Cucumber Salsa, Garden Quinoa with Pesto Sauce, Tomato Tart, Strawberry Rhubarb Lattice Pie and Party Fruit Punch. Click the link for more information. From Patricia Rose: I tasted this dish at a “Food Bloggers of Los Angeles” meeting. Judy Lyness of TwoBroadsTravel.com hosted our summer picnic event and I fell in love with this dish, continuing to go back for more until it was completely gone. The key is in the marinade and the meat quality. 1. Add soy sauce, vinegar, molasses, ginger, chiles and garlic to blender and puree. 2. Place sliced beef in non-metal dish. Pour marinade over beef and toss. Cover and refrigerate for 4 hours or overnight. 3. Strain marinade from beef and retain. 4. Heat wok or skillet on medium high. Add beef and cook until caramelized, about 3-5 minutes. Remove beef to a bowl. 5. Add reserved marinate to skillet and reduce until thick. Pour over cooked beef and toss. Let cool slightly. Add red and yellow peppers, green onion, mint and cilantro. Toss again. 6. Plate and serve. Yum! Lynne, thanks for coming to our Main Dish Salads Cooking Class. You captured “the moment” beautifully with your gorgeous photography. Come back to class anytime. 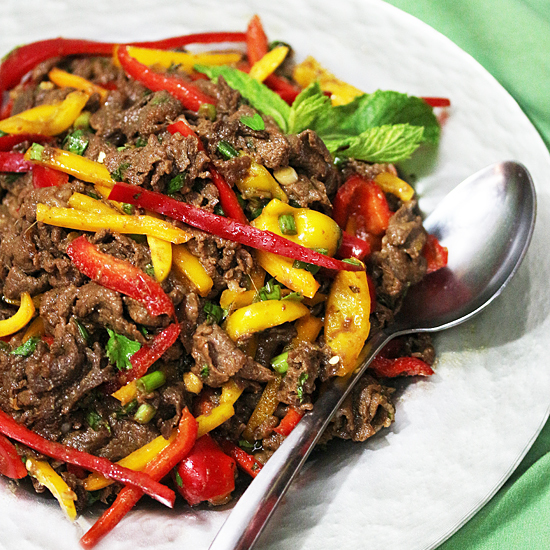 I have eaten this fabulous Thai Beef Salad and it is the best! I enjoyed your photos so much.